The recent PricewaterhouseCoopers report estimates that the video game market will increase from $31.6 billion in 2006 to $48.9 billion in 2011 (please find my prior posting Serious Games: A Sizeable Market - Update). Business Week exclusive series looks at just some of the innovations that are sparking this growth rate. BW Special Report on the Power of Gaming and related items embed almost 10 articles, some of of which address the increasing contribution of Serious Games to the overall game market. 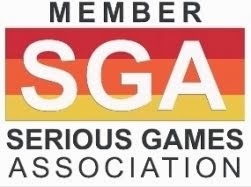 The article Getting Serious About Gaming challenges us to look to the fringe and see two promising areas for growth that aren't acknowledged by the PwC report: the broad category of serious games and the newer attempts to meld gaming with the social-networking features of Web 2.0. According to Evan Wilson, an analyst with Pacific Crest Securities, the real growth in video games will come from these areas. "Traditional games have become too complex for all but the most hard-core players in the industry, and it's the stimulation of the non-hard-core audience that will drive meaningful industry growth," Wilson said. In the article Video Games Entertain and Educate, David Perry predicts future efforts from the major gaming studios that will result in, “games that promote positive values, or that teach or inspire players". But it's on the article The Name of the Game Is Work that I would like to focus on. Companies are creating their own online video games to recruit, train, and communicate more effectively across divisions and continents. Even more traditionally conservative industries such as insurance and finance are now giving immersive games a whirl. According to a 2007 survey by the eLearning Guild, which polled nearly 1,500 of its members, from large and small companies throughout the U.S., 38% of insurance companies are investigating using games for work. In finance, accounting, and banking, that figure was above 50%. To be competitive globally "requires deep creativity and imagination, strategic and analytical thinking, decision-making, excellence in planning and execution, and adaptation to rapid change. These key skills are the skills people exercise when they play sophisticated digital games." Here are some of the companies creating innovative online games for their employees. 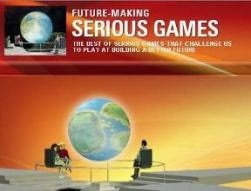 McKinsey & Co.'s German headquarters has been using a game called CEO of the Future for the past several years. In the game, contestants try leading a company: Players who increase the value of the company by the largest margin win. Johnson & Johnson Pharmaceutical Research and Development has used an online "university" for three years to help new hires acclimate. 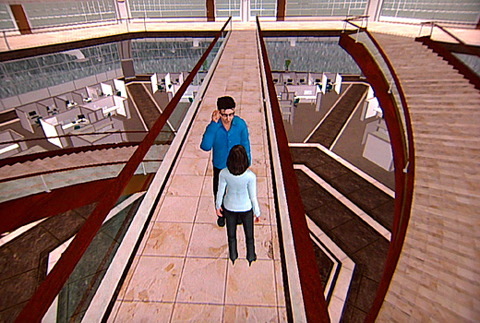 The university, called 3DU, resembles the popular virtual world Second Life: all new employees get an avatar and can sign on at any time to walk around, meet their colleagues, and ask questions about benefits such as health care. 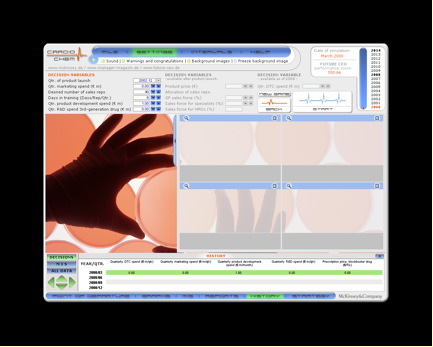 This past spring, the same pharmaceutical R&D company within J&J, launched a game called Mission Possible to let people new to the department better understand the drug development process and to help veteran regulation experts get up to speed on the latest trends in drug marketing. Employees had to develop a new drug to treat schizophrenia, and answer questions at various stages of the drug development process from characters such as Dan Discovery or Marvel Marketing. After answering questions correctly, they got their passports stamped and were able to move up through the game's levels. This fall, IBM will start selling a 3D immersive business game to its consulting clients to help employees improve business processes. Players will go into a virtual business unit to tackle such tasks as redesigning a call center, opening a brokerage account, or processing an insurance claim. Who Wants to Be a Sales Star? Sears Retail Training has used a game that incorporates elements of Jeopardy and Who Wants to Be a Millionaire? to help its 10,000 sales associates improve customer experience in stores. In one part of the game, salespeople have to choose photographs and text to engage customers. If they ask the right questions and create an optimal customer experience, they sell their product. 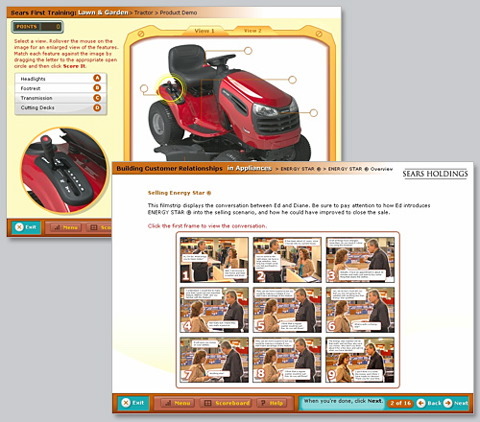 In another part of the game, they practice demonstrating the features of products such as tractors so they can do the same task more effectively in real world stores. In these games, players can quickly change their management style if it doesn't work. "The lessons learned in these games become increasingly useful as companies become less command-and-control and more a series of distributed networks around the world."